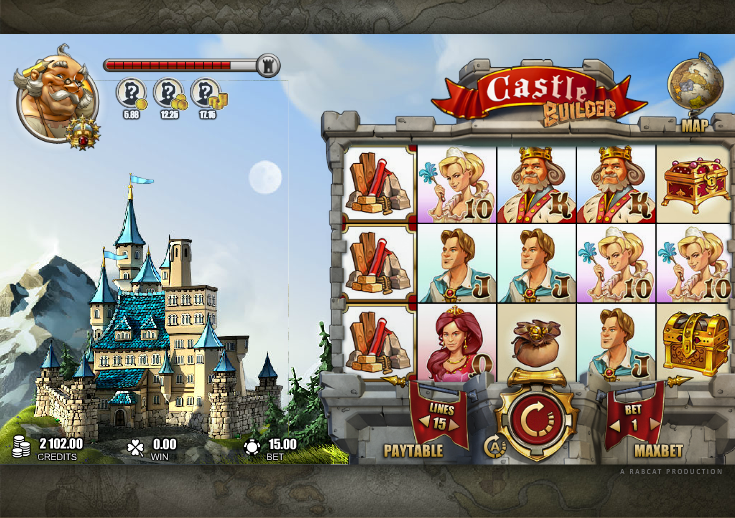 Castle Builder is a brand new online slot from Rabcat Gaming and it’s got a fantastic narrative storyline we’d like to see more of as games develop. Castle Builder tells the story of the king of a distant land and his desire to get his daughters married off and to build castles for them. Castle Builder plays out over five reels and up to fifteen paylines and the reels themselves occupy a relatively small part of the screen area. That’s because the left hand side is given over to the building site for the next castle and we shall explain more about this feature below. The symbols here are all related to the theme and include the king, his son and two daughters; also we have a pouch of money, a jewellery box, a treasure chest and a locked door. Special symbols are building materials and then an architect who represents the wild. Getting more valuable building blocks for your castle means it will be worth more when it’s complete. As you collect blocks they will gradually build up the castle in the space to the left of the reels. When the castle is complete you will see a short cut scene showing the king’s daughter and you will get to choose from one of three possible suitors. Each is worth a different prize amount based on the value of the castle. The three values underneath the progress bar in the top left hand corner represent how much each suitor is worth. Now the game continues and you progress to building the next castle and marrying off the next daughter or son. 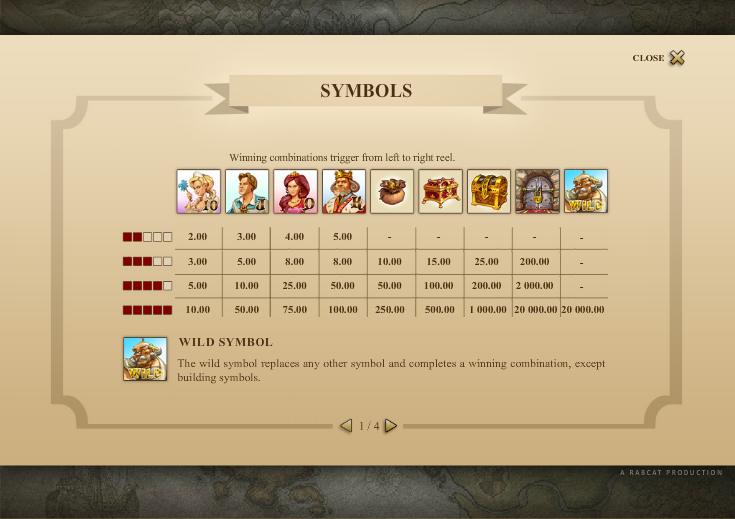 There are various kings and kingdoms available as you progress and you can check your progress by clicking the ‘Map’ button in the top right hand corner. Building the castles is the main aim of this game and to do that you need to land the building materials; these can only be gathered on an active payline so make sure you play with all fifteen selected. This is a really entertaining game which uses the level progression feature to it’s advantage. Completing a castle doesn’t take long and you are constantly tempted to carry on playing to reach the next level. Good stuff!